It's the Google Play Store's third birthday! Do you guys remember when it was called the Android Market? Back in October 2010, the Android Market had 100,000 apps lining its shelves which was one-third the number that the App Store had available. At that time, we asked whether the Android Market could catch up. Well, we all know the answer to that question since both app repositories now offer pretty much the same number of apps. 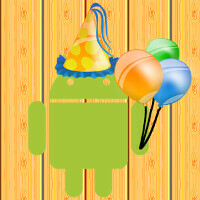 For the Google Play Store's birthday, prices are being reduced on a number of items. Want to revisit the moment of television gold when Walter and Jessie went into business together? Season One of Breaking Bad can be purchased for $9.99. Want to Kill Bill? Volume One and Volume Two can be yours for $2.99 each. For the same price, the crime drama The Departed will have you wondering. Wondering why Mark Wahlberg didn't win an Oscar for best supporting actor, that is. And Runntastic Runner, a fitness tracking app, can be all yours for just 10 cents. A list of 33 "Hot Deals" can be found by clicking on the sourcelink. Help the Google Play Store celebrate its third birthday by picking up some content on the cheap. No need to thank us for finding these, it's what we do. Troll like you will fit right in. One billion downloads celebration was the best so far, now I'm offered some boring stuff in my particular region. Garbage offering Google. WTF give us something quality please. Very under whelming, mostly just junk! Amazon's last free even was a lot better.